When a recipe mentions a springform pan, I get a little giddy. I’m assured, I can do this. The “Apricot-Strawberry Tart,” from the May/June 2016 issue of Eating Well, is a real joy, for many reasons. The dry ingredients include white whole-wheat flour, almond meal, and sugar -- no white flour. That’s neat. Next, I need not use my mixer. Instead, I get to work in the cold butter with my hands. Then, the egg yolks and vanilla are mixed in with a spoon. Apricot preserves are spread over the crust. Easy. I sliced adorable donut peaches (rather than apricots), because that’s what I indulged in at the time. I sliced my strawberries. Total baking time is more than an hour. Then, this needs to cool for more than an hour. Finally, you’ll get to enjoy eating this tart. It’s got a wonderfully crumbly crust. 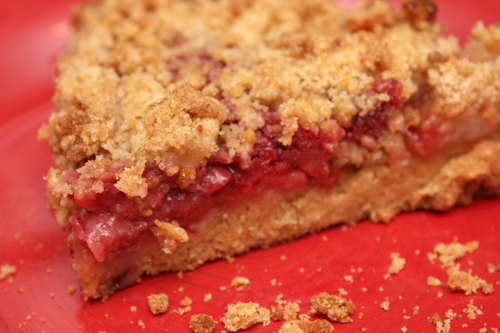 The tart is moist enough, sweet enough, and not too tart. All happiness. Next time, I want to take a plunge into the “Oreo Macarons,” from Liv For Cake. Oreo cookie crumbs will figure in, here. Come back to my site next week, to see what happens with my rough, barbarian hands.